I will be completely honest with you here and tell you that I really had never even thought about placing an air conditioner inside a tent. The thought never crossed my mind. It didn’t appear very plausible and didn’t really seem like something I would want to do. Being slightly self-centered, I suppose that I subconsciously assumed that no one else would want an air conditioner in their tent, either. This notion stuck with me for a long time, until I began researching tents for this website. Over and over again I came across consumers complaining that their tents did not have air conditioning. I found question and answer sections on other websites where potential consumers repeatedly asked if it was possible to put an air conditioner in one tent or another. Over and over again, I found that these people were being laughed at and made fun of by the other people on these websites. 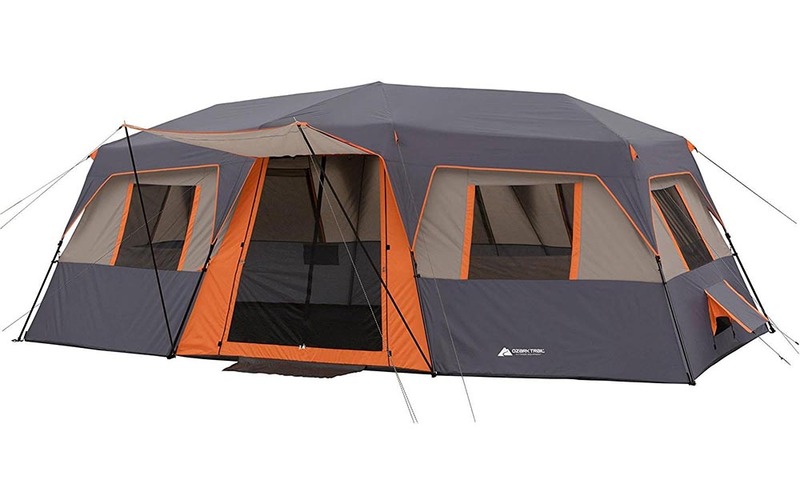 Obviously, though, the fact that so many people were interested in finding this type of tent means that it is something I should include on this website. If you are one of the people out there looking for an air conditioner friendly tent, do not feel bad – there are many more people who feel the same way you do. To attach an air conditioner to this particular tent, simply lift the Velcro flap on either of the ground vents. There will be a mesh window beneath these flaps to keep bugs out. You will not need to remove this mesh screen – your air conditioner will simply press up against it. The flap has triangular side panels attached to it so that they come up to form little walls when you pull the flap upward. Fit the flap and side panels around the front of the air conditioner unit to funnel the cool air into the tent. I would suggest placing your air conditioner on top of something sturdy and angling it away from the tent so that the water inside the unit drips away from your tent. Measuring twenty feet by ten feet, this tent can be divided into three separate rooms with detachable divider panels. Each of two room panels features a zipper down its center. As someone whose children have literally ripped tents when trying to squeeze between walls and divider screens, it gives me great comfort to know that they would be able to simply unzip the panel when they needed to move through from one room to another. Each separate room measures 10 feet by approximately 6.5 feet. You can easily fit a queen-sized air mattress in each of these three spaces, making enough room for up to nine people to sleep very comfortably with plenty of room to spare for walking, changing clothes, or storing belongings. The tent measures approximately 6.5 feet in height which means that you will be able to set your air mattresses atop stands without having to worry about hitting your head off the ceiling or feeling claustrophobic. Whether you choose to use an air conditioner or not, the ground vents allow cool air to enter the tent as hot, humid air escapes through the mesh roof. Six zippable windows and large windows on each of the two doors also allow air to flow through with ease. There is at least one window per wall, which will allow the breeze to make its way into the tent, no matter which direction it is blowing. Who doesn’t like things that are instant? From microwaves to instant coffee, our fast-paced society has been trying to speed up processes for decades. Instant tents are just another thing on the long list of objects and gadgets designed to make your life easier and to free up more of your time. Whereas many of these other “instant gratification” products are meant to free up more time for work-related tasks, instant tents are designed to free up more time for relaxation and exploration. Instead of spending hours trying to read picture instructions for setting up your tent and fussing about with poles that, for some strange reason, do not seem to fit together, you can quickly and easily set up this Ozark Trail Instant Cabin. All you need to do is open it up, extend the poles, clip the tent onto the poles, stand it up, peg it into the ground, and you are ready to go enjoy the rest of your camping trip.